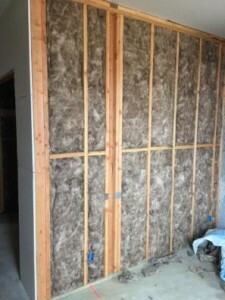 Batt, Blown-In and Spray Foam insulation are particularly effective means of insulating walls. It saves energy, reduces heating and cooling bills, controls noise, and even reduces condensation. Read on to learn all the ways that adding insulation to your walls can benefit you. Good insulation stops the flow of heat into and out of the home. This makes your home more energy efficient all year round. Insulation acts to keep both heat and air conditioning in the house, meaning your HVAC system will not have to work as hard and your energy bills will be lower. Insulation on exterior walls puts a blanket-like barrier between your living area and extreme outdoor temperatures. Insulating your walls can prevent this by limiting air movement, enabling you to save up to 40 percent in heating and cooling bills. Insulating walls can reduce annoying sounds from outdoors and it reduces sound carrying from one room to another. By insulating your walls, you’re reducing sound transmission and maximizing your enjoyment of every room in your house. With insulated interior walls, there’s less worry about whether the TV’s too loud as the sound will not carry as much as when your walls are insulated. Moisture trapped within your home’s walls can cause all sorts of problems. If this water condenses within the walls, it can cause rot, mildew or even frozen patches of moisture that cause staining when they melt. Insulating with a vapor resistant membrane attached to your insulation reduces condensation caused when the moisture caused by daily activities like bathing, cooking and washing tries to move through the walls of your house to the colder outside. When Do You Know It Is Time to Insulate?